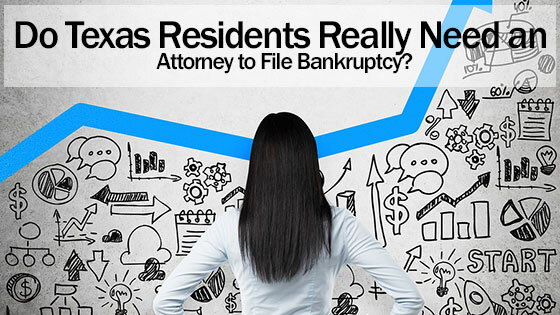 Home » Blog » Do Texas Residents Really Need an Attorney to File Bankruptcy? If you are facing the prospect of filing for bankruptcy, it’s understandable that you would want to save money. You are very likely debating whether or not you really need to hire a bankruptcy attorney for this process. You may even have heard from some sources who claim that you’re better off without one. As with all such situations, the truth is somewhere in the middle. There may be a few individuals who are happy and more than capable to go it alone through the entire process of filing for Chapter 7 or Chapter 13 bankruptcy. But the great majority of people will probably benefit from having a legal expert present who can explain and then streamline the process on their behalf. The first thing you need to understand is that you will have to pay a filing fee of $335 to file for chapter 7 and $310 to file under chapter 13. This fee will be exacted whether or not you hire a bankruptcy attorney. It’s the minimum cost of doing business in the court system of Texas. You can buy a “File for Bankruptcy” kit that will explain to you all of the various steps that are involved in the process. But so much of it may be Greek to you that you will very likely miss out some very important step that will snarl up your case for weeks or months to come. Most people who attempt to file bankruptcy on their own are unsuccessful and eventually need the assistance of a bankruptcy attorney. Therefore, it is much more prudent to hire a bankruptcy attorney as soon as possible to represent you in your case. The most important thing that an attorney can do for you is to help you gather all of the documents you need to make your case. These will normally include all records that relate to your outstanding debt. They may be statements that relate to your mortgage, credit card debt, student loan debt, and any medical bills that remain unpaid. You will also need to provide proof of income as well as a list of your day to day expenses. Finally, you will need to be able to give the court a full list of all of your creditors, including their contact info and how much you owe each of them. These are all things that you may have records of. However, if you don’t, it’s certainly helpful to have a trained legal expert that can help you track them all down in order to utilize them in your bankruptcy case. If you do not have legal knowledge or experience, you may end up making very serious mistakes. You may end up losing some of your legal rights. An experienced bankruptcy attorney will help you avoid these pitfalls. Call our law offices today at any of our convenient locations and get a free consultation from an experience bankruptcy attorney from the Law Offices of David Kohm.